17 roses as a teenager. The age of natural beauty, like the rose. 17 roses as a teenager. 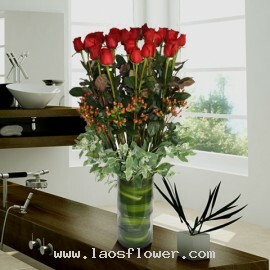 The age of natural beauty, like the rose that first hint cherish and yet bursting with bright and cheery. 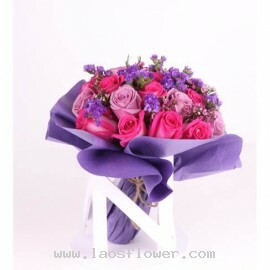 Bouquet of 17 roses consist of pink roses and purple roses accent with purple statice flowers . Wrapped in purple paper tied with brown hemp rope. 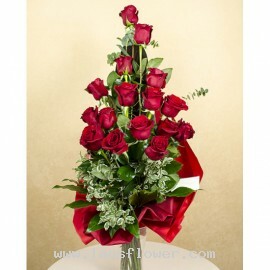 * Customers can choose to change the color of roses and paper as desired. Please notify the shop when ordering or by e-mail. Occasionally, substitutio..
A bouquet of 17 red roses arrange as a pyramid shape accent with green leaves and eucalyptus leaves wrapped with red paper. Other leaves may be substituted depending on the availability. * The color of flowers and paper can be changed as you like. Occasionally, substitutions may be necessary to c..
17 long-stemmed red roses arranged in a tall glass vase accents with red mickey mouse and green leaves. The color of roses can be changed as you like. Occasionally, substitutions may be necessary to create your bouquet due to the availability of certain flowers in various parts of the country. 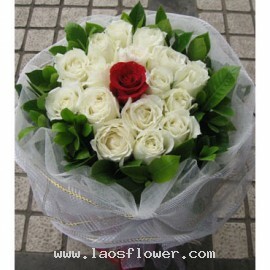 Su..
17 roses bouquet consist of 16 white roses and 1 red rose in the middle. Wrapped in white and white bow. The roses, materials used to wrap, and ribbon can be changed to any color you like. Occasionally, substitutions may be necessary to create your bouquet due to the availability of certain flowe..